When we began designing our new kitchen, the main goal was to create a functional space with plenty of storage. Both of which were nearly non-existent in the old space. It was a delicate balance of cabinets, drawers, and appliances that would help us to meet our goals. We knew two things going into the planning and that was (1) what we previously had didn't work and (2) we would need to utilize storage containers and organizers to get the functional space we desired. 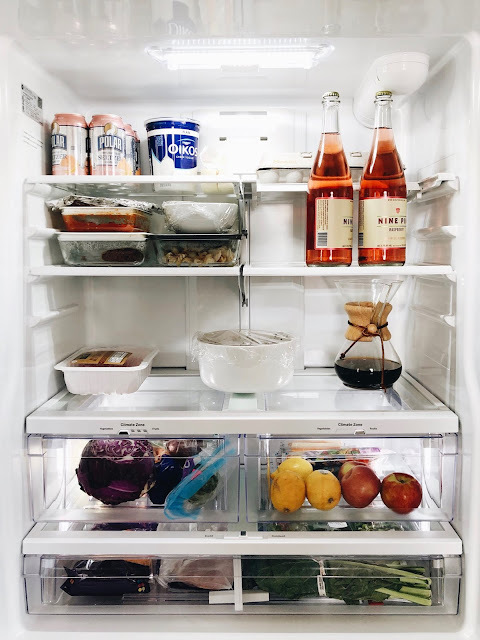 We went with InterDesign Binz from The Container Store for much of our new kitchen including our refrigerator. 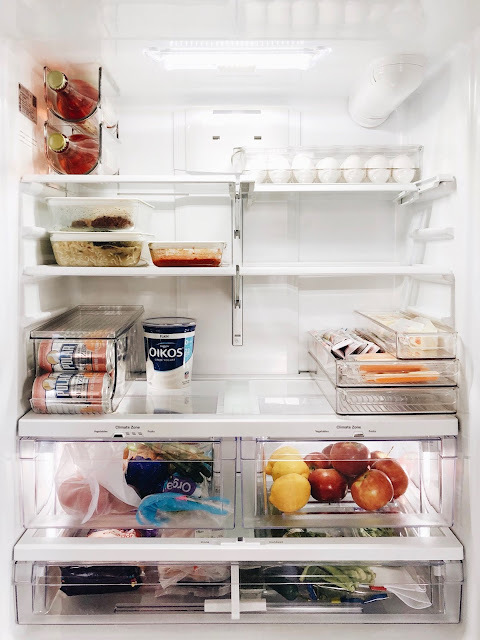 We loved the clear and stackable containers and felt these features would be the key to staying organized as they allowed us to not only see what was being stored but also take advantage of vertical space by stacking items that might not otherwise stack well. Before organizing and adding the InterDesign Biz, our refrigerator was functional but not nearly as much as it could be. Tall bottles blocked access to other shelves, snacks, cans and leftover foods required Tetris like placement to make sure they would not come tumbling out when the refrigerator doors were opened. Now, everything is easily accessible and we have been able to eliminate most food packages allowing for us to not only use the space better but also see what we still have left as well as what we are running out of. One other item we addressed when planning storage for the new space was the lack a pantry in the old kitchen. Our new layout required a bit of planning to get even the most minimal of added pantry space. This meant no room for large boxes, multiples or unnecessary/unused food items. The Artisan Glass Canisters with Oak lids were perfect for the tight space to store all of our dry goods and continue the wood aesthetic that can be found throughout our kitchen. Since the newly added pantry was so limited on space we decided on storing all spices in a drawer below the prep station. It was easily one of the best decisions we have made in storage. 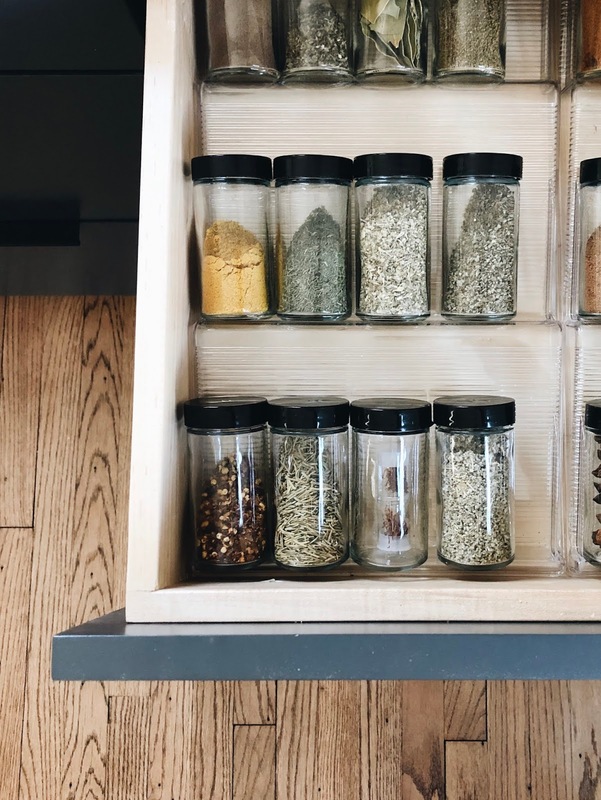 The spice drawer is made up of two InterDesign Linus in-drawer spice racks and glass spice jars which has brought organization and symmetry to a kitchen item whose storage is usually forgotten about all together. The Container Store has made our kitchen organization so seamless and we couldn't be happier with each piece. Now through April 7th The Container Store is holding their annual Kitchen Sale with hundreds of kitchen storage and organization products on sale for 25% off making it the perfect time to start your spring cleaning and organizing! The Container Store generously provided products to me at no cost. All views and opinions remain my own.